So imagine my anger when I rolled over and checked my phone to see that I’d woken up at 12.38pm! Hardly surprising considering I’d arrived from London the previous day but still, very annoying. 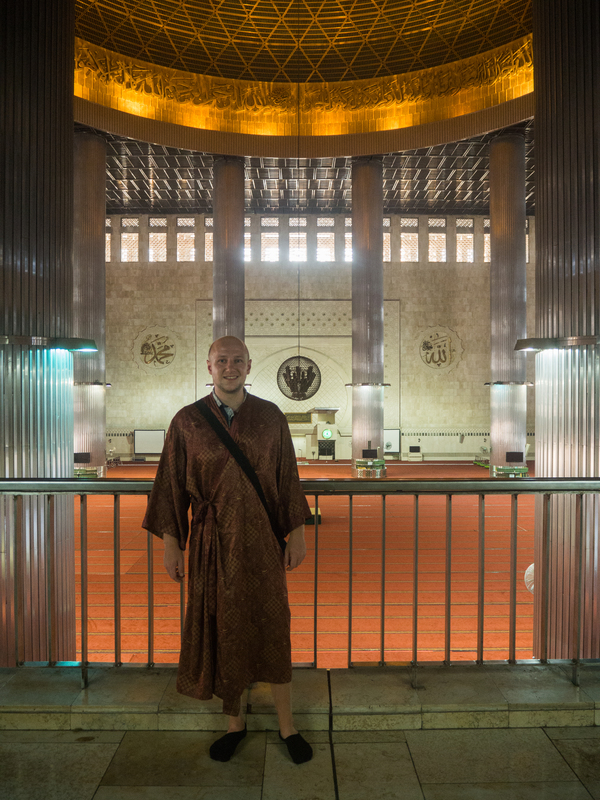 I now found myself with even less time to see the sights of Jakarta, so I quickly chucked on the nearest clothes I could find and headed out of the door. Thankfully(?) I’d heard there wasn’t a great deal to see in the city, so I still managed to cram the essentials into what was pretty much half a day. Just around the corner from my hotel was the first item on my itinerary: The National Monument. 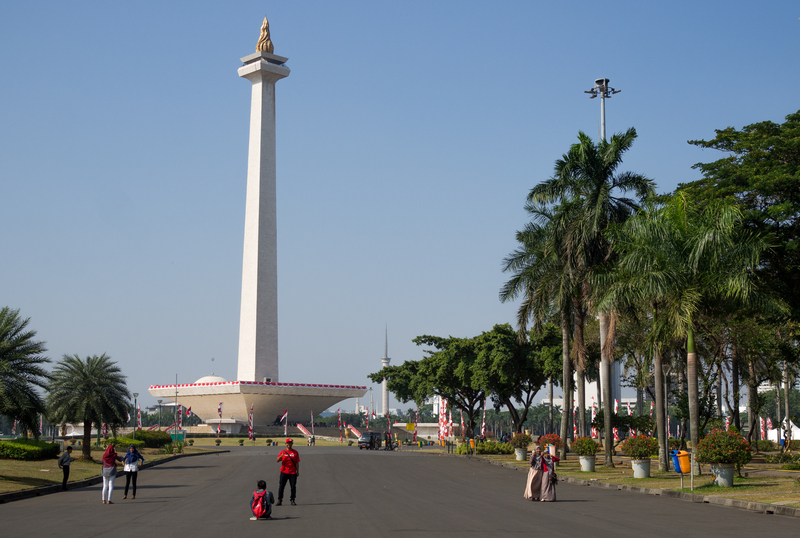 Standing at 433 feet tall, the tower symbolises Indonesian independence from when the country was handed back by the Dutch. Or something like that. Situated in large green grounds, the tower is open daily and visitors can go up to the top and view the city from the observation deck, although the smog may put any plans of a decent view to bed. There’s also the National History Museum nearby too. Unfortunately due to the large queues (I didn’t know about the 2018 Asian Games until I arrived!) and my even shorter than anticipated day, I ended up skipping the tower and museum in favour of seeing more of the city. Besides, I got a few pictures and ate some food, and that’s the real quiz. Annoyingly there was only one gate open in the monument grounds, and it couldn’t have been more inconvenient for walking to South-East Asia’s mosque. A 10 minute walk became a half-hour one, which was quite a trial for an Englishman in 30 degree heat and dripping humidity. I took the opportunity on the way to snap a few pictures, and managed to take a sneaky shot of an old fella sat on a bench which I quite liked. I took the shot, carried on with my day and crossed the road towards the mosque. Little did I know the impact this chap would have on my day! A couple of minutes later, I saw the very same man weaving his way through the traffic to cross the road; I can only assume zebra crossings are too mainstream for this guy. I had my headphones in but heard a very clear “Hello sir!” – he was definitely talking to me. After exchanging pleasantries, he told me he’d just finished work at the monument and was heading to the mosque. Assuming he was going to pray, I walked with him to the mosque without thinking twice. Before I knew it, he had me taking my shoes off, putting on appropriate clothing (almost as fetching as the sarong I had to wear in Kandy! ), and he was giving me a tour. I’m sure you’ll agree that I wear it well. By this point I knew what the deal was: he was giving me ‘a tour’ and I would give him ‘a tip’ at the end for his services. Fair’s fair, although I didn’t actually ask for it. It was informative – he told me about the history of the mosque, tales of visits from Barack Obama, David Cameron and Angela Merkel – and he took me into a few restricted areas where I got some decent pictures! A mosque and a church living together in perfect harmony! So I pulled the first note out of my pocket. A 50,000 rupiah. Only a few quid, but always start low, right? Thirty dollars. That’s close to 500,000 rupiah. Ten times more than what I’d offered, for a tour I didn’t even ask for. Besides, surely paying for ‘the information’ and paying him were the same thing? After all, the information came from him! The biggest drum in the world…apparently. It went back and forth for a good five minutes and at one point he even suggested he walk me to an ATM and I can take out the money from there. In the end we settled on I gave him 150,000 and told him to take it or leave it. Of course, he took it; we walked the same way towards the exit in an awkward silence. I’ve just realised I barely said a word about the mosque. It’s beautiful. Just don’t slip into the same trap I did. With the sun setting thanks to being set back even further by that charlatan, I found myself reaching the old town of Jakarta in the dark. Surrounded by colonial buildings, this part of the city has a more European feel to it and it’s clear that the Dutch influence still reigns strong here. 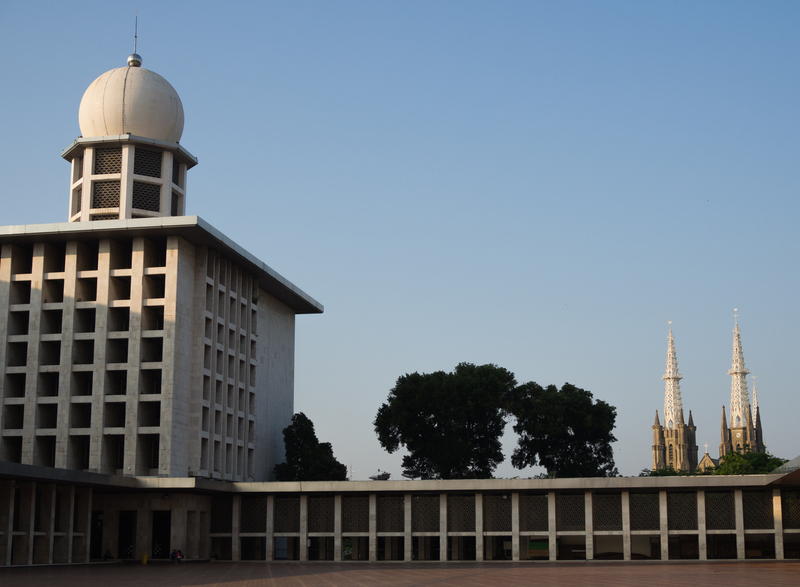 Sunset over the Jakarta History Museum. 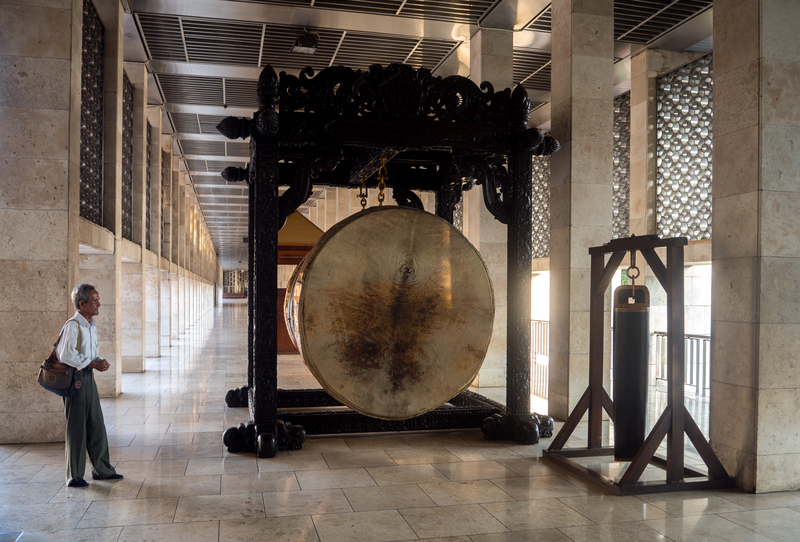 Many of the buildings have now been transformed into museums and galleries, and the square in front of what is now the Jakarta History Museum is a lively place with a buzzing atmosphere. Children running around, loved-up couples taking a stroll under the moonlight – it’s got it all. Unfortunately due to time constraints I didn’t have time to go to any museums and pretend to be doing anything other than aimlessly wandering around and going acting like I know what I’m doing. I’m just not a museum guy. 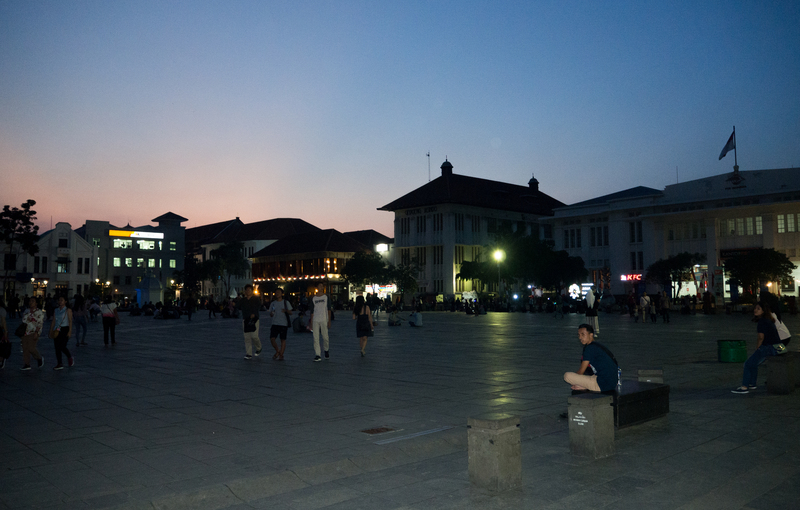 The bright lights of Kota Tua. I did, however, spend a bit of time wandering down the streets and found a great selection of street performers, mime artists and – most importantly – a bustling street behind the History Museum with more street food vendors than you can shake a stick at. More on that in a later post! Finally, a quick stop-off in Jakarta’s Chinatown on the way back to my hotel. I’d been told by an old colleague that it was a place to visit where things can get a bit crazy. Sold! 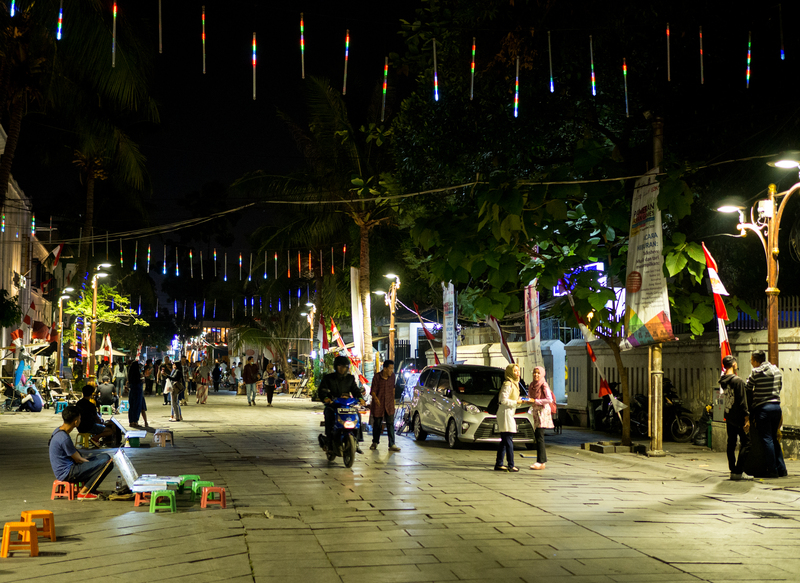 A quick search on Wikitravel suggested that Jalan Mangga Besar was indeed the place to be, so I took a walk down there and found once again a bustling street full of life. There were marching bands raising money, street food stalls (naturally) and a larger than average amount of ladies of the night peddling their services. Just a box full of snakes, nothing to see here guys. 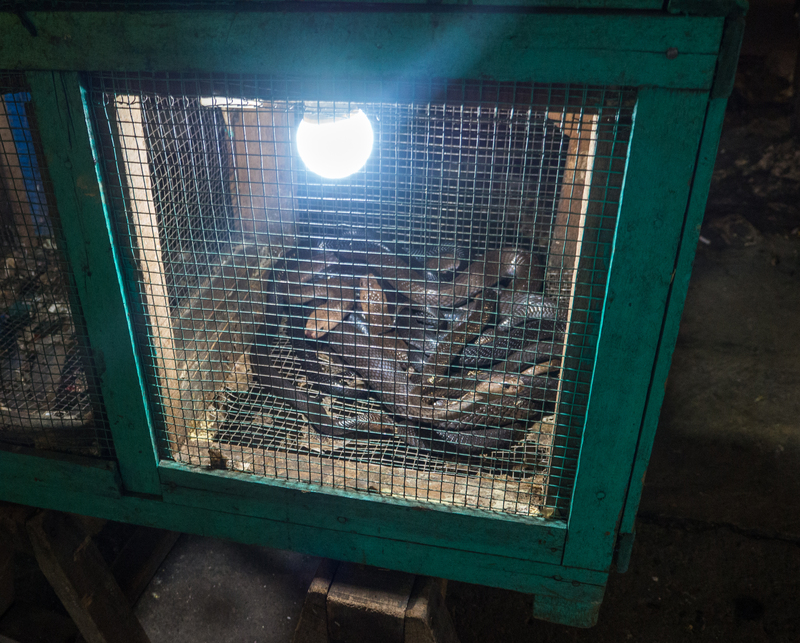 The real reason I was there, however, was to sample something of a local delicacy: cobra! Needless to say I accomplished my goal and you can read about that in a later post. After a quick beer in one of the seedier bars (seriously, I just always happen to find them), I decided that was enough for one day. 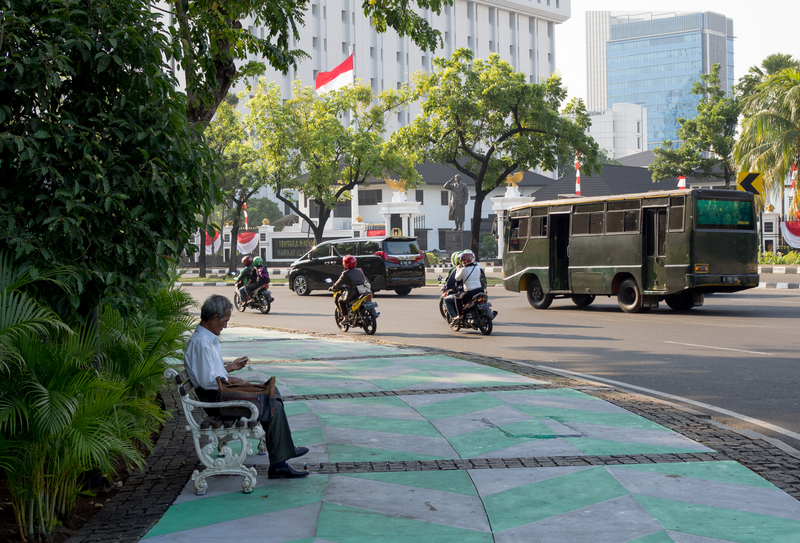 I was intrigued by Jakarta – it gave me a similar vibe to Colombo and even had a similar sweet, fragrant smell from the cigarettes people were smoking. Oddly enough, this wasn’t a bad thing at all. I’m almost certain Indonesia will be seeing me again. It’s not a case of ‘if’, more a case of ‘when’.